In a widely circulated article for Vox.com entitled “Against Transparency: Government Official’s Email Should be Private, Just Like Their Phone Calls,” Matthew Yglesias writes that because of the frequency of digital communication by government officials, “Treating email as public by default rather than private like phone calls does not serve the public interest.” He did not mention that the Freedom of Information Act is now based upon “Presumption of Openness” that requires all executive branch records to be subject to release unless they qualify for one of nine** FOIA exemptions. Yglesias is wrong on many of his arguments beginning with his hazy recap of the 1787 Constitutional Convention. He implies that no “complete and accurate record” exists to bolster his claims that transparency harms effective deliberation. But this is contrary to the rather voluminous existent record of the Convention showing how the framers thought and the justifications which they cited. Also factually incorrect is his assertion that phone calls are inherently “private.” Dean Acheson documented his conversations; they’re available on the Truman Library’s website. Eisenhower’s Secretary of State Christian Herter documented his as well. The National Security Archive, after a decades-long fight, has won the release of more than 16,700 Kissinger Telcons, transcripts of his telephone calls. His argument that “Email isn’t mail” –along with being incorrect– is also not novel. It is the exact argument made by the Reagan Administration to the National Security Archive as it attempted to delete all all traces of its emails before turning the keys to the White House over to the H.W. Bush Administration in January 1989. 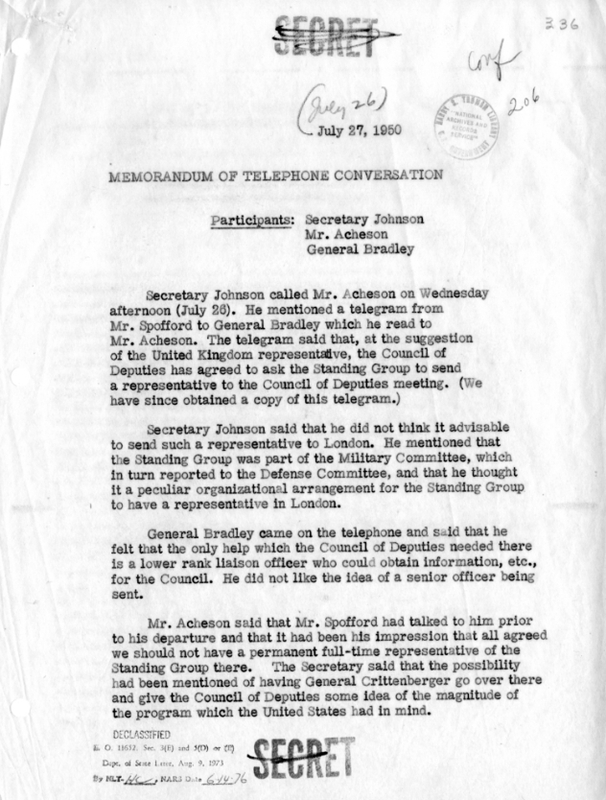 Attempting to justify deletion of the email, the responsible official at NARA told the National Security Archive that federal emails were akin to telephone messages slips, not worthy for preservation. Fortunately, for all journalists not named Yglesias, U.S. District Court judge Barrington D. Parker rejected this assertion, ruled for the Archive and against Reagan’s acting Attorney General John Bolton (yes, that one), and granted the restraining order that preserved the Reagan Administration’s emails from deletion. After years of legal battles with both Democratic and Republican administrations, the National Security Archive eventually won the preservation of several hundred thousand White House emails from the Reagan presidency, nearly a half million from the Bush-41 term, 32 million from Clinton, and an estimated 220 million from Bush-43. Our settlement with the Obama administration ensures that all of his White House emails (along with Blackberry messages) will also be preserved and per the Presidential Records Act, will be available for FOIA requests as early as five years after he leaves office. So, to be clear, Yglesias’s argument is not a new, provocative idea. There has been much discussion about the topic, and there is clear law and court precedent that emails (and text messages, and Slack messages, and Gchats) are firmly established federal records. It’s the law of the land. In fact, the US National Archives is currently completing work to ensure that each and every federal agency has a system in place by December 2016 to “manage all email records in an accessible electronic format” –so that they can more effectively be preserved and released in response to FOIA requests. Yglesias’s second point, echoed from Cass Sunstein in a speech he delivered at a Columbia University celebration of FOIA @50 is that the status quo of preserving emails as federal records “serves as a deterrent to frankness and honesty.” Sunstein has used this argument to try and create a dubious distinction between “output” and “input” transparency. Sunstein lauds the government’s release of information it chooses , but criticizes attempts to make public information that is inconvenient for government employees, including policy discussions. But as National Security Archive director Tom Blanton pointed out to Sunstein at the event (video at the 50′ mark), a great irony is that Samantha Power who is married to Cass Sunstein, won the Pulitzer Prize for a study based “input transparency.” Power’s 2003 groundbreaking history A Problem from Hell, was based largely based on FOIA requests about “input” policy decisions that she and other National Security Archive staff filed. Power’s book specifically criticizes the intransigence of US agencies, noting the need for “congressional inquiries with the power to subpoena documents and to summon US officials of all ranks in the executive and legislative branches,” as it was nearly impossible to obtain “meaningful disclosure” about the Rwandan genocide through the FOIA process. Exemption b(5) of the FOIA, known as the “deliberative process” exemption, was added so bureaucrats could have frank discussions of policy decisions outside of the public eye. Those concerns are also why Congress and many state legislatures are wholly exempt from public records requests. And, as any frequent FOIA requester will tell you, exemption b(5) is also wildly abused by government officials to redact anything embarrassing or trivial they do not want disclosed. In fact, it’s known among disappointed requesters as the “withhold it because you want to” exemption. In 2013, the Obama administration applied exemption b(5) to 13 percent of all the FOIA requests it processed that year. Part of the recently passed FOIA Improvement Act of 2016 included a 25-year limit on withholding such “predecisional” documents. 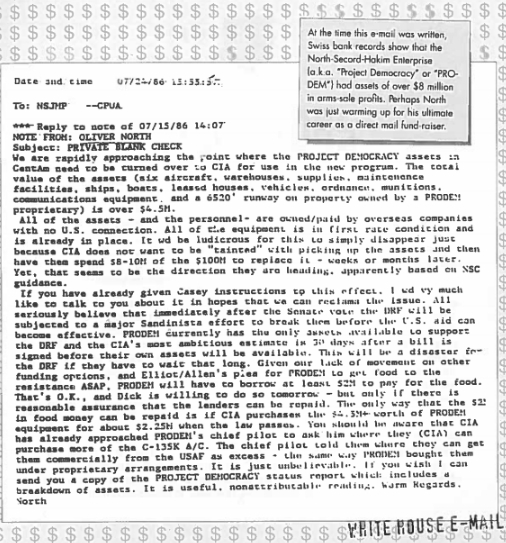 In a FOIA lawsuit filed by the National Security Archive in 2012, the CIA successfully argued in court that a 30-year-old internal history of the Bay of Pigs invasion was “predecisional” and exempt from disclosure under exemption b(5). So much for chilling effects. The House version of the FOIA bill, which did not pass, had even better language on Exemption Five reform which would have protected proper deliberative conversations while doing a better job prohibiting its widespread abuse (documented here, be sure to check the comments as well). But beyond not –ahem– explaining the current situation or laws on the books, Yglesias is also wrong about his assumption that public officials will always find ways to avoid public records requests and laws. The fact is that almost nothing happens within the federal government without a record of it. 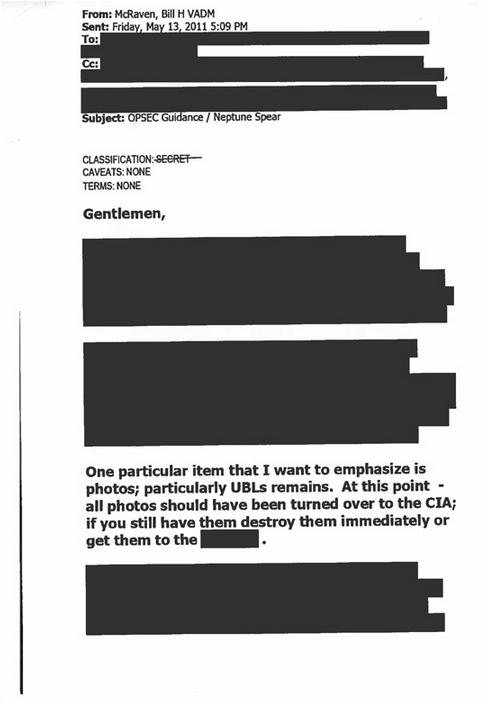 Very frequently this record is preserved in email. And in most cases, the public –which funds the government– should have access to this record. I can also speak about this from a personal perspective. For the past two years I’ve served on the Federal FOIA Advisory Committee, a group of half federal employees half outsiders who work to make the FOIA better. At the end of last year’s term, we unanimously published a report on the lack of effective oversight of FOIA, and formally recommended for OMB to reissue its outdated guidance on FOIA fees. As a member of this federal committee, I am careful to treat every email I write as if it will someday be made public. And I can say (and I think my colleagues that dealt with me can say about me!) that it has not chilled my outspokenness, willingness to rethink issues, ability to brainstorm, or truthfulness at all. If anything, realizing that the record I am creating is (probably) a federal record paid for by taxpayers makes the care I give to the emails (even the brief ones that Yglesias says that people should not care about) more effective. From my perspective at my small role as a federal participant I can say that in no way would making emails private have a positive effect on how the FOIA Advisory Committee or the federal government works. While very few people (unfortunately) are interested in the emails of the FOIA Federal Advisory Committee, the benefits of access to other emails –which were unmentioned in Yglesias’s piece– are obvious. *Emails from Flint, Michigan exposing both the cost-driven decisions not to add corrosion controls to Flint water supply, and the cover-up to hide the grave mistake. *An email from the State Department’s Press Secretary to the Secretary of State boasting of how the Department successfully “planted” questions on 60 Minutes. *Emails showing that USAID hoped long FOIA delays would soften backlash to its “Fake Cuban Twitter” program. *Emails revealing that the Department of Homeland Security is regularly monitoring the activities of Black Lives Matter protesters. *Emails documenting how the Department of Justice successfully lobbied to kill the 2014 FOIA Reform Act. *Emails showing how Chris Christie and his staff clogged the George Washington Bridge. *Emails demonstrating how the Egg Lobby conspired to destroy a vegan competitor. *Emails showing how Coca-Cola helped steer the CDC to push for regulations more favorable to the soda industry. *Emails about UC Davis’s attempt to erase its history of pepper spraying protesters. *And emails describing how officials timed releasing information related to child safety for when it was politically expedient. Yglesias’s attack on the public’s access to its government’s emails is just the latest in a percolation of “attention-grabbing assertion[s] that excessive openness and transparency are one of the causes of our country’s governance woes.” Fortunately, Gary Bass, Danielle Brian, and Norman Eisen have authored a definitive paper debunking these regurgitating myths. I take no issue with Sunstein’s and Yglesias’s calls for more “output disclosure” –disclosure of all types of the very valuable data held by the government. But for the most part, the Obama administration is pretty good about giving the public access to the data that it wants to give out. The beauty and importance of the Freedom of Information Act and the emails covered by it, is that the public has a fighting chance to get the information that citizens need, and that government employees often wish to hide. **There are actually closer to 300 FOIA exemptions. Statutory FOIA exemptions have run amok.